Updates: It's pleasing to note that on Facebook and Twitter, people are making one another aware of the gross misreporting by The Malaysian Insider. Tai Zee Kin, for one, says TMI should apologize to AWO for the "unforgivable misquote". On blogosphere, ABITW writes No toll hike, but cost saving planned. That's good news, no? Khairul Azwan Harun, the Umno Youth deputy chief, was quick to respond to AWO's so-called insensitive statement. Too quick. And, unfortunately, too lazy to check his facts. The result of his folly: Umno Youth disagrees with Wahid on toll hike, says remarks insensitive. Now, what did AWO actually say? The Minister was asked the question yesterday afternoon, after the ETP progam at PICC in Putrajaya, about FUTURE tolled road concessions to be given out, NOT EXISTING tolled roads which are already bound by existing concession agreements. AWO did comment on existing tolled roads and concession agreements, but that was last Saturday. You can read it h e r e.
Too much lah, the Malaysian Insider. All this Pakatan media, not professional ..
Best fair and unbiased coverage can be found at Utusan and NST..they can never be wrong and no misreporting from them. Heck..any newspaper that hit out at opposition are very professional..
Good one Rocky, after the election, everything naik. Perfect timing! BN cares for the rakyat. Undi BN! Hidup BN! 1) new highways (to be constructed) proposed by the private sector must provide motorists with new alternative alignment. This is an obvious statement. From the time of the PLUS highway this has always been the case. It does not take a Minister to figure this out. 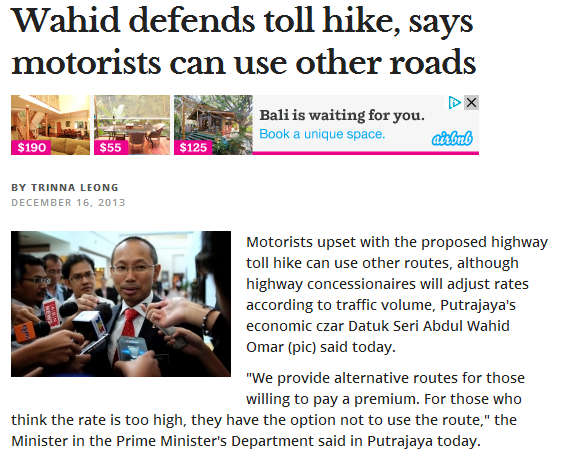 Does Wahid mean that if the govt (and not the private sector) builds the toll road, there is no need to make alternative routes available? This question does not arise. It is an ignorant suggestion. Which motorist will say 'I like tolls - of any amount' ? Who will say 'I like higher fuel prices'. Were such studies done for the PLUS and other toll roads? Alternative roads are available. Who does not like, can take the alternative route. Of course it has to be bankable. Another obvious statement. If it is not bankable the project will not be possible. 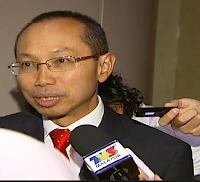 "Abdul Wahid said concessionaires were now required to conduct viability studies for new highways to ascertain if users were receptive to the proposed new toll rates prior to implementation. "For all the future projects that is done we analyse the viability of the projects. We ask project promoters to also come do a study on the reception of potential users on the toll rate that they are willing to pay. That will be for future awards. To make sure that rates we agree on the agreement is a rate people are prepared to pay," he said. Exactly as per the video. But what else did he reportedly say? "We provide alternative routes for those willing to pay a premium. For those who think the rate is too high, they have the option not to use the route," the Minister in the Prime Minister's Department said in Putrajaya today. Either this part is totally fictitious, or the cameraman has this on tape along with the reported TV3 clip. About three other mikes were in Wahid's face so it's gonna be hard to run, ya. Either way, umno youth needs to investigate further, in order to preserve the honour of Encik Khairul Azwan Harun. In the meantime, this blog earns a Green Dot! Yay! A group of slit eyed men standing in a circle jerk. Vigorously jerking off while pulling faces of 'syiok-ness' with their buck tooth, slit eyes, yellow skin with warts and all. That my friends, is what TMI is. A group of opposition pseudo writers and their merry band of cheer-leaders. of course throw in a melayu sesat or two to add legitimacy to using the term representing the 'rakyat'. The same people who will be getting a hard on with their tiny uncircumcized kukuchiau when utusan makes a mistake suddenly have no comments when TMI slips up. People are shooting for the toll rate hike not the young minister head. He's just the talking parrot no more than that. Whether MI attempted to deceive the public or not is immaterial nowadays. What we know is that UMNO cheated the East Malaysians, Malays, non-Malays and many others all the times. The only one who gains in UMNO is all the Mamaks whether they are big, small, old and even the mamak cow. Tmi is rubbish. Had a long run in. They are so afraid to publish my contrarion comments for years. Its a typical pr mindset. covering tor their stupidity. they think everyone is as gullible and dumb like their pr supporters.If I see the bloody jahabar I would give him an earful. Bloody hypocritical imbecile. This is another example of ppl putting their foot into everything that they have no clues whatsoever or envious of AWO who has been a successful and smart Malay. I have known AWO during my work time as a man with integrity and he knows the in and out of toll highways. 1. Some previous toll roads uses existing alignment of federal roads (ie govt road eg LDP) and there is no requirement to replace such. I believe this is not the case now. 3. The certainty of toll rates and its justification are always a sore point on the bankability of toll projects. Based on my experience, without wanting to say too much, I want to remind everybody that it has never been easy previously for any toll concessionaire in undertaking their proposal to the Govt. With this current hoohaa, I would say it will even be more arduous in the future.